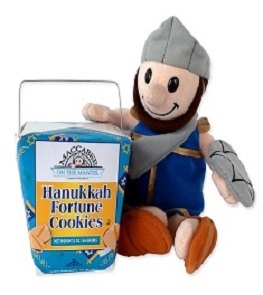 The 9-inch plush Musical Maccabee! So tasty. 'Tis the season for holiday goodness, and this year is super special (for me) because Christmas and Chanukah coincide! Now, I'm not super stoked because we celebrate both in our house (there's no Chanukah bush, folks), but because it's a tad less alienating when the Jewish and Christian holidays coincide and as someone who grew up with all the trappings and jingle bells of Christmas, that means something. I've sung the praises of this time of year with its snowy sites, festive lights, and delicious smells a million times on this blog. November and December are truly my most favorite months of the year because, well, because I just love everything about these months. Colder weather, twinkling lights, the smells of pumpkin pie and cocoa ... [insert heavy, happy sigh here]. With that said, I was elated when the folks behind the Maccabee on the Mantel at ToyVey Toys reached out with their new line of products for review, because Chanukah is coming, folks! 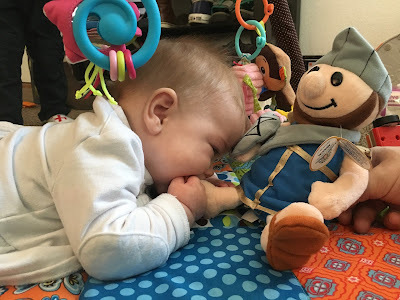 I reviewed the Maccabee on the Mantel nearly two years ago when Asher was so, so small. Of the three products I received for review that year, the Maccabee was, by far, the most high-quality, engaging, and tied-in to Chanukah without feeling too kitschy. This year, the company has taken the Maccabee up to a whole new level with several new products, which means a Maccabee for Little T and for Asher. The quality is even better than before, and with the new options, there's something for everyone (including something tasty)! 18-inch Maccabee: This is Asher's favorite. He's huge, and awesome, and super cuddly. My only kvetch? Asher very easily removed the shields and shoes of both of his Maccabees. Now, I don't think this is a huge issue because, come on, he can get creative with his Maccabees, but my husband would prefer they be a bit more securely attached. If you're curious what an unboxing with Asher looks like, here it is, unedited! Welcome to the chaos and fun of unboxing new toys with a toddler! Want to win a Maccabee on the Mantel for your own Chanukah-ready monkey at home? Comment on this post with your favorite thing about this time of year, and you'll be entered to win a 9-inch Maccabee and box of Hanukkah fortune cookies! Share the post on social media, and you'll get an extra entry (just comment with where you shared the content, please). Details: Giveaway ends on Thursday, November 10, 2016, at 5 p.m. MT.